Home / Kisumu / Lake Victoria / Raila Odinga / Uhuru Kenyatta / Was The Water Hyacinth Removal Project A Hoax? In a highly publicized event, Uhuru Kenyatta launched an ambitious project that promised Lake Victoria dwellers the destruction and elimination of the menace of Water Hyacinth from the lake. Consequently, a water hyacinth dredger was procured to aid in the intended mission. Water Hyacinth is a free floating perennial aquatic plant with broad, thick, glossy, ovate leaves that may rise as high as 1 meter above water. Its presence in the lake has brought untold problems to the fishermen who depend on the lake for income and natives who depend on the lake as a source of water for domestic use. 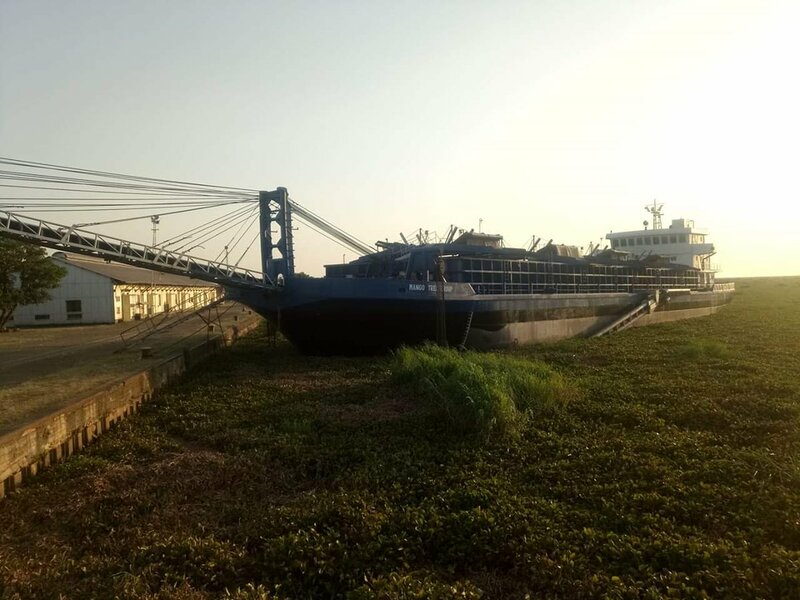 A social media user has brought to the attention of Kenyans the fact that the dredger is lying idle, docked in the port of Kisumu weeks after it was commissioned for work. Last month Raila launched something the media claimed to be a water hyacinth dredger in Kisumu, unfortunately immediately after all the cameras were rolled away, the old scrap was docked and never to be switched on again. The statement by Job Oyugi has been debunked after a series of fact checking exercises by Daily Updates Africa. We contacted the office of African Union Special Envoy Raila Odinga and we were informed that neither did Raila Odinga launch nor commission the project. He merely attended the commissioning that was done by the government through president Uhuru Kenyatta. The dredger is also factually lying idle for reasons known. The project was to commence three months after the launch. The three months have not elapsed. The residents of Kisumu and other towns that border the lake have expressed optimism that the project once commenced will improve their lives. The water hyacinth harbors dangerous aquatic animals like Hippos, crocodiles, insects and snakes. It also makes the process of moving boats very difficult and sometimes even futile.